BRIEFLY: Adobe steps up a gear with this much improved editor. But is it good enough to dethrone Dreamweaver? 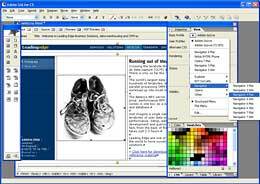 Photoshop has long been the tool of choice for mocking up web templates and outputting web graphics for many professional designers, but its sister web editor, GoLive, has always stood in the shadow of its rival, Dreamweaver. Now rebranded as part of Adobe's wallet-curdling Creative Suite, Adobe are trying to lure designers with a tightly integrated solution to web site creation, putting GoLive in the heart of the design process. The program certainly bears a close resemblance to other components of the Creative Suite, with an interface that will look familiar to Photoshop users, complete with collapsible palettes and a neat 1600% zoom feature to help you make pixel perfect layouts. Setting up new pages is easy using the WYSIWYG layout view - simply drag a layout grid on to a new document and set the required width. Then it's simply a case of dragging over text and picture boxes, specifying whether you want a table or layer-based layout. Text can be formatted using old-school HTML tags or by using GoLive's dedicated CSS Editor, which lets you create and edit your own styles with real-time visual feedback. Although powerful, it's a bit of a ungainly beast compared to Dreamweaver's far slicker offering. Although GoLive is a predominantly visual web editor, there's ample support for tinkering with the source code, with a colour-coded source code editor offering useful tools like auto-tag completion, code snippets and search and replace tools. Another nice touch is the ability to preview how your pages may look in a wide range of different browsers. GoLive scores with its integration with other Adobe products and technologies. 'Smart Objects' lets you import, optimise, crop and resize Photoshop, Image Ready and Illustrator files without having to switch back and forth between applications. If you need to edit a SmartObject, a double click opens up the file in the parent application with any changes being reflected in the web-optimised version. For users of Adobe's big-gun DTP application, InDesign, the new 'Package for GoLive' feature may prove irresistible. This automatically converts and optimises print documents into PDFs which can then be edited and amended in GoLive's PDF Preview window. GoLive's comprehensive set of authoring features may still not be enough to lure Dreamweaver fans into the fold, but for authors working in a print and graphics environment, its tight integration with Adobe's Creative Suite can provide a very powerful, all-in-one solution.